Ian Hart: Is there ever a good time to play Tottenham? It was very much a point gained on Monday night after a spirited comeback from 2-0 down at St Mary’s. 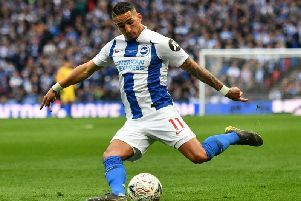 A Shane Duffy header and an injury-time spot-kick from Glenn Murray pegged Southampton back to 2-2 and Chris Hughton’s men made their way back along the M27 with probably more positives, second half that is, than their hosts. Next up at the Amex it’s the visit of Tottenham, with a 5.30pm tea-time kick-off to accommodate live television coverage. A little over a year ago I wrote in this column on the eve of the Albion’s Premier League debut that the points up for grabs against the big six, namely, City, United, Liverpool, Chelsea, Arsenal and Spurs, were effectively a ‘free hit’. The Albion shouldn’t have expected anything from these matches in their first season in the top flight, whether home or away, 36 points I know, but even as the eternal Albion optimist, a degree of caution was required at that time. I wasn’t totally wrong, outplayed both home and away by Liverpool and City, a blank return from Chelsea in both games, and defeats on the road at Spurs, Arsenal and Manchester United. That leaves three matches, the Amex visits of Arsenal, Spurs and Manchester United, which not only spawned three great Albion performances, but a seven point return. Wins against Arsenal and United and a draw against Spurs, with many saying Mauricio Pochettino’s men were lucky to travel back up the A23 with a point. Another win against United in the first home game of the season reiterated that the Albion, while never realistically ever going to be title challengers, on a match to match basis have the ability and, equally as importantly, the belief, to take on the top teams and get results. Spurs arrive on Saturday having lost three games on the bounce, Watford, Liverpool and Inter Milan, for the first time since Tim Sherwood’s brief tenure as manager at White Hart Lane ended in 2014. Having chosen not to invest in new players in the window, Pochettino comes to the Amex under a lot of pressure. Is he the management answer to the Emperor’s New Clothes? And is now, with live TV coverage, the best time to play Spurs? Over the last few years many questions have been asked about whether Tottenham can handle pressure situations. Their last day 5-0 capitulation against an already relegated Newcastle saw them miss out on the runners-up spot behind Leicester. Then several Spurs players played in the England side that were humiliated by Iceland at the Euros in 2016. And now Saturday represents another huge test of Pochettino’s ability. In my opinion, there’s a both a positive and negative argument for the Albion. Even though they are professional footballers at the top of their game, the pressure, in a run like this must tell on the Spurs team. Look at the Arsenal body language last season when the Albion humbled them at the Amex. The first goal, at whatever time it is scored, will be crucial. Is it a case that Spurs simply cannot afford to lose? And if the Albion score first, will the Tottenham heads go down even further? Prediction time, I think the Albion will score first, and again, and run out 2-0 winners, see you next week! Is Brighton v Tottenham on TV, what time is kick-off, what are the odds?